At Davinici Therapeutic Massage, we offer a variety of physical therapy services to help fit your individual needs. This approach involves the skillful use of the hands to manipulate and mobilize joints as well as lengthen soft tissue. Manual therapy techniques are utilized to reduce pain and most importantly improve neuromuscular control of the involved structures. We believe very strongly in this treatment approach and invest heavily in continuing education and personal study to advance our manual skill set. A variety of techniques fall within the label of manual therapy. We will select and utilize techniques for each patient that best suits their individual needs and concerns. No two patients are alike, thus each should be respected as such and receive personalized care tailored to their individual needs. ** Necessary for proper assessment and determination of treatment plan ** BOOK NOW! 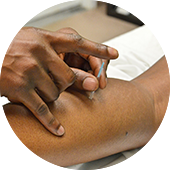 Dry needling is a technique designed to treat muscular pain, specifically trigger points. Much of the knowledge we have regarding trigger points came from the work of Dr. Janet Travel MD and Dr. David Simons MD. Trigger points are a localized area within a muscle where the muscle fibers remain shortened and in a contracted state. This area is often palpable as a taught band or knot. Our bodies may create muscular tightness and spasm as a protective mechanism following injury or in association with degenerative processes. This results in added compression or loading of joints, tissues and most significantly the nerves. The subsequent irritation may facilitate additional tightness and spasm. This cycle may resolve independently over time however often remains and may be a significant contributing factor to many chronic pain conditions. Trigger point dry needling is a technique utilized to release these areas and in turn reduce or eliminate the referral pattern of pain while allowing improved function of the associated structures. Temporomandibular Joint Disorder (TMD/TMJ) or TMJ syndrome, refers to acute or chronic inflammation of the temporomandibular joint. The joint is located in front of the lower part of the ear and connects the jaw bone to the skull. The TMJ is a ball and socket joint similar to the hip or shoulder. When the mouth is opened wide, the ball slides forward out of the socket and returns when the mouth is closed. VM addresses structural imbalances throughout the body including musculoskeletal, vascular, nervous, urogenital, respiratory, digestive and lymphatic dysfunction. Gentle hands on techniques evaluate and treat loss of motion in relation to organs, membranes, fascia and ligaments. Orthopedic care encompasses a wide variety of treatment approaches and areas. Shoulder, elbow, hand, hip, knee, foot and ankle concerns are all areas commonly addressed in physical therapy. The need for treatment often is due to increased pain with decreased motion and decreased functional use. Treatment is utilized after injury, before and after surgery and when overall function is less than optimal. Treatment often incorporates manual therapy, strengthening, exercise prescription and neuromuscular reeducation.